Mount Tamborine Wine Tasting Tours have been show casing Queensland wine for more than 10 years . 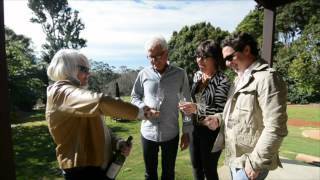 Guests explore the Wine Trail and well-kept secrets of the spectacular vista that is Tamborine. Sample the very best of Queensland award winning wines, sipping reds and whites, your taste buds will be exploding with the delights of boutique crafted liquors, beers, cheeses and fudge. Visits are pre-booked with the wineries to ensure the very best attention at each and every cellar door. They consider themselves the wine tour specialists, making them the tour of choice for those wanting that personalised, pampered, experience. They provide tours for groups of 2 to 50 in number - birthdays, engagements, that special couple's weekend away, corporate events or rewards and Hen's/Bucks tours . Seven days a week, they offer door to door service to most areas of the Gold Coast, Tamborine and Brisbane in air-conditioned luxury comfort. They cater for the local Gold Coast and Brisbane communities, Interstate Visitors and International Tourists. Their passion is wine and they live by the motto "Life is too short to drink bad wines." Don't be disappointed, book in advance. They can't wait to see you! Please contact operator for individual details. Mount Tamborine Wine Tasting Tours are simply the wine tour specialists. You can select from full day tours or tailored options to suit the needs of your group. They cater for locals, interstate visitors, international guests, birthdays, family get togethers, corporate and reward functions- Hen's/Buck's days. Just ask them and they can accommodate. Call to arrange your tour today.